Not long ago, nuclear power was unthinkable among environmentalists, particularly in California, where a moratorium on new power plants has put a lid on the industry for thirty years. But that sentiment may be changing. 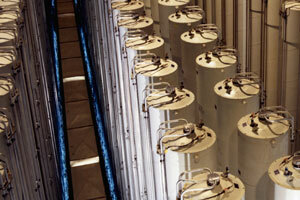 You may listen to the “Reconsidering Nuclear Power” Radio report online. I really enjoyed this story. One of the big selling points of nuclear is its offsetting of greenhouse gases. Can you give me some idea of the offset? For example, let’s say we wanted to keep our CO2 production at current levels. How many nuclear power plants would we need to build to supply any increases we needed in energy production? How big a dent will these nuclear power plants put in the U.S.’s carbon footprint? Existing reactors in the U.S. produce 100 GW of electricity, 20% of U.S. consumption. This is approximately one full “climate stabilization wedge,” where the idea is that one would have some 8 to 10 different technologies (efficiency, renewables, etc.) that added together would serve to stablize carbon emissions. Thus if the U.S. were to double its nuclear capacity by 2030 (quite reasonable, since we built the first 100 GW in a roughly comparable time), then nuclear could provide a second stabilization wedge. This is a reasonable goal to shoot for. less, with expansions in energy efficiency. I hope anyone who is seriously thinking that building new nuclear energy plants might be a good idea will not rely solely on the hype of the nuclear energy industry. There are already breakthroughs in alternative energy technology, especially solar, which are far cheaper and safer and that promise to make it wholly unnecessary to take on the serious inherent risks associated with nuclear energy production.